Sometimes a customer (through no fault of their own) ends up in a serious time crunch or realizing that they suddenly need to find a new material for their part. This is where BTE shines. We had been manufacturing laptop work surfaces for hospitals with PC-ABS for quite a few years without an issue. However, over time our customer realized that using heavy cleaning solvents on a regular basis was causing the plastic to crack over time. We did some research and realized that if we used RTP to make the work surfaces they would be resistant to heavy cleaners. Around the time we were working on the laptop work surface we received a call from a new customer who needed a wheel stand done for a car show, and he needed it fast. We made 40 samples with design improvements to the customer immediately for inspection. Once the customer gave us the O.K. to create more we manufactured the full amount needed within three weeks and shipped the finished parts to the customer in Utah in time for the show. At BTE we pride ourselves on punctuality and excellent quality service. 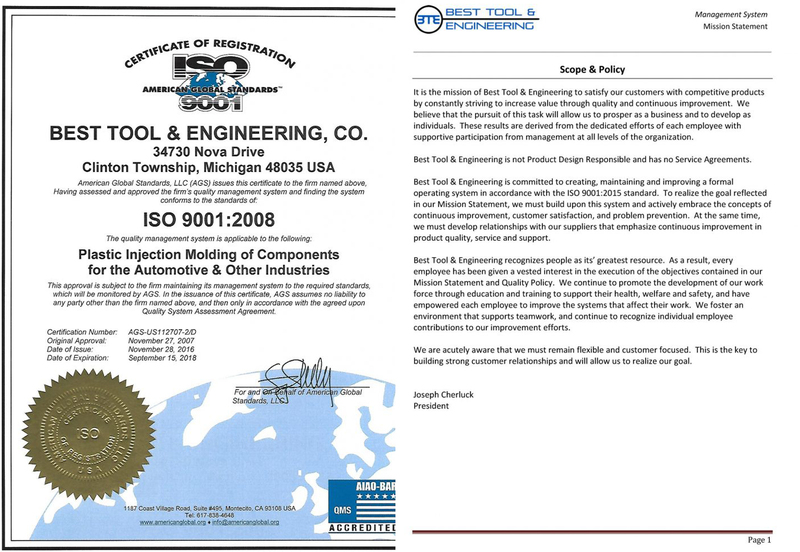 We hope that we can help you with our future plastic injection molding dilemmas in the future.